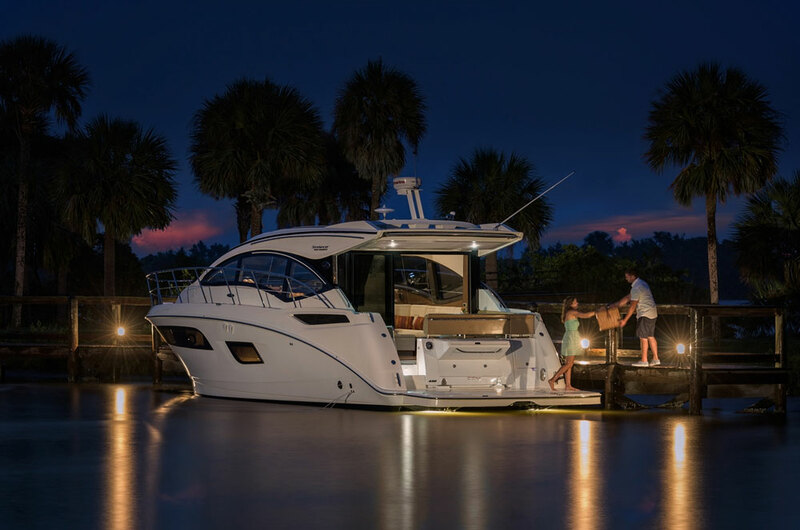 The Sea Ray 400 Sundancer and Flybridge models bring big boat design to smaller options. 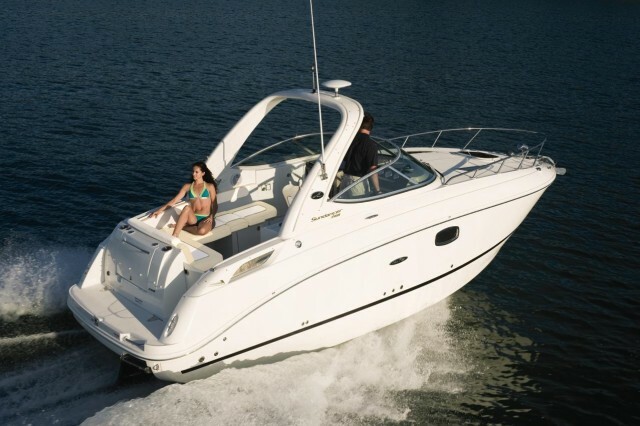 The Express Cruiser design has long been known for providing lots of open air and sunshine, and some might say Sea Ray perfected the genre with their eminently popular Sundancer line. As we saw in the Sea Ray 400 Sundancer: First Look Video, however, many of the Sundancer models have been going through some major changes. Instead of being open the helm-deck on this new 400 is fully enclosed, making it the smallest Sundancer in the line to have an aft bulkhead enclosing this area. Why’d they do it? 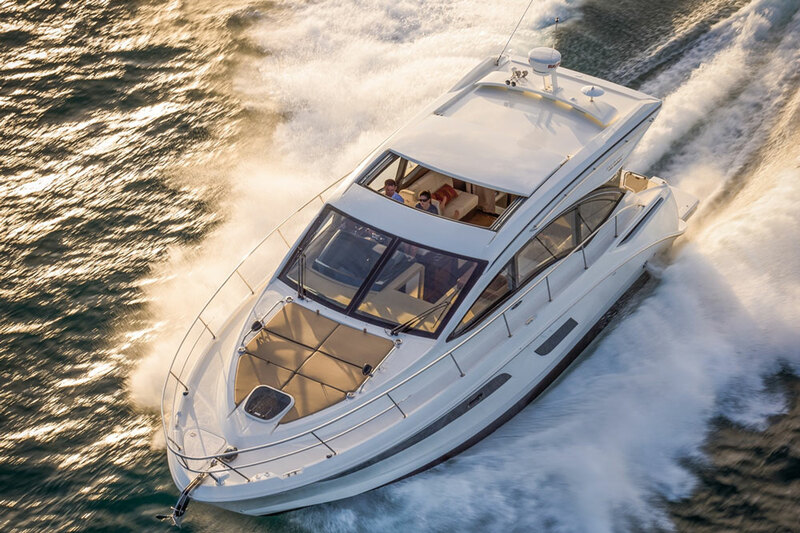 Because on larger Sea Ray yachts like the L650 and the L590, Sea Ray proved it’s possible to create an enclosed cabin without losing the feeling of being outdoors. They applied the theory to the Sundancer line with larger models like the 510 and 470, met with success, and kept rolling those changes down the line. Added bonus: enclosing this area makes it easy to drop a flybridge on top, and build a second model on the same platform—hence the 400 Flybridge. Add on a flying bridge and enjoy the views from up top. How did Sea Ray keep that outdoorsy attitude, even while enclosing a major portion of the boat that was previously open to a breeze? For starters, the entire aft bulkhead is a three-panel sliding glass door. Two of the three panels slide off to port, so you can eliminate two-thirds of that bulkhead at any time. Then, Sea Ray surrounded the other three sides of what used to be the helm-deck—now it’s really a full-blown cabin—with very large windows. And to cap it all off, they installed a huge opening sunroof overhead. When we say huge, we mean it—slide it back at the press of a button, and about a quarter of the cabin’s top disappears. Still, you’re going to get less sun and spray than you would have on the old 40 Sundancer. As well as being open between the windshield and the hard top, the top on that model was significantly smaller and didn’t cover nearly as much of the aft cockpit. Some boaters will see this as an advantage, others will see it as a deficit. Look at the pictures in some used 40 Sundancer listings, and you’ll see what we mean. On the flybridge model, of course, the big sunroof is lost and the cabin tilts that much more towards feeling enclosed. On the flip side, when you’re ready for some fresh air just climb the stairs to the flying bridge, and you’ll soak in as much sun and fresh air as you can handle. Other than swapping the opening sunroof for the bridge, the cabin on the 400 Flybridge is essentially the same as on the Sundancer. It still gets the opening aft doors, all the windows, and even the lower helm station remains in place. Pricing, however, is not a mirror image. In fact, the Flybridge MSRP’s at about $100,000 more than the Sundancer, breaking the three-quarter-million mark. 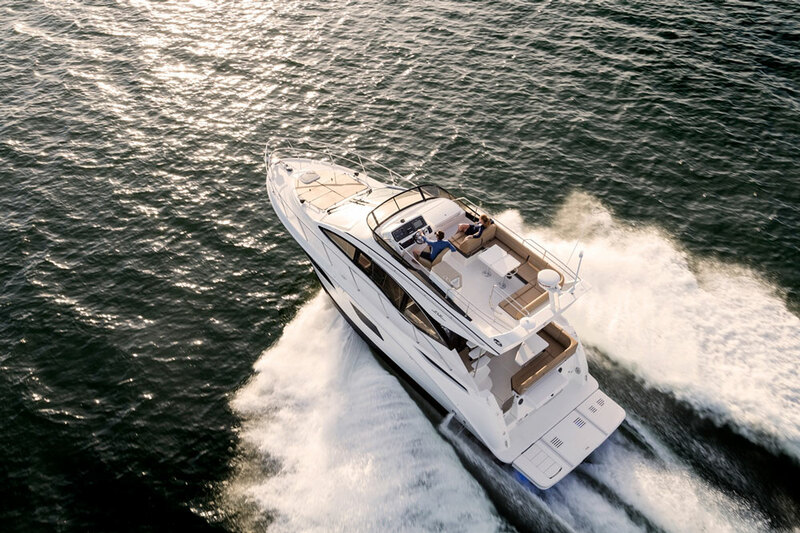 The 400 Sundancer and 400 Flybridge share the same aft cockpit, foredeck, and lower cabin arrangements, and Sea Ray makes the most of each area. In the aft cockpit there’s a settee with a dinette table; an aft “grilling station” with a built-in electric grill, a sink, and food-prep area; and of course an extended swim platform. The foredeck is dedicated to sun-worship, with large pads and swing-up backrests. And belowdecks there’s a master stateroom with a queen berth forward, plus a guest stateroom with twin berths amidships. You have the option between getting the boat with two head compartments, or get a single head and the extra space is used for a pair of large hanging lockers. 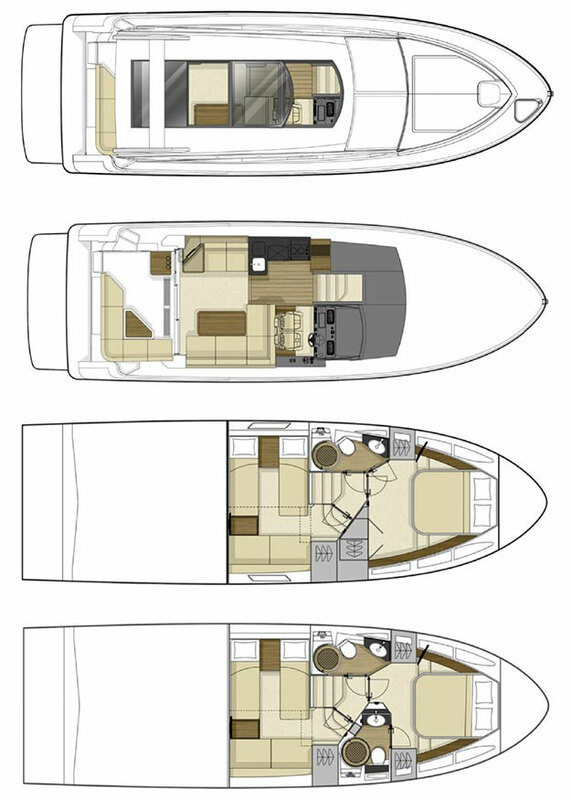 Beyond the aforementioned differences due to the addition of the flybridge, the 400 models share the same essential layouts. Another commonality between these models is the power system. Both run on a pair of 480 HP Cummins QSB 6.7 diesel inboards, hitched to V-drives. That gives them a cruise of around 30 MPH at just a hair under one MPG, and a top-end in the mid to upper 30’s. Going with the flybridge model shaves off a couple MPH. Interestingly, as Sea Ray has moved this more enclosed design down the Sundancer line to smaller and smaller boats, it’s also moved the wide-open dayboat design up to larger and larger boats. The 350 SLX is now one of the biggest runabouts around—we hesitate to even call a 35’ boat a runabout, but that’s truly what this model is. Will the wide-open and fully-enclosed designs continue their trends, and meet in the middle? 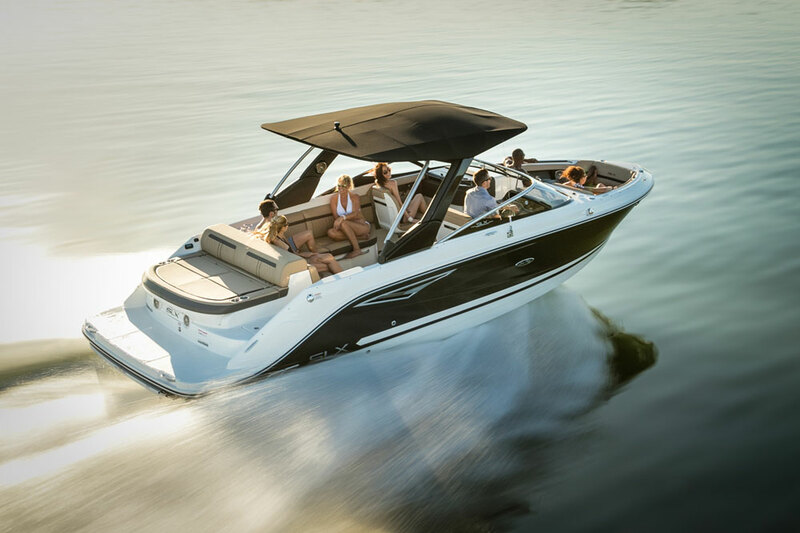 We can’t predict the future, but we can say one thing for sure: whichever type of boat you like, with their incredibly comprehensive line-up there’s a pretty good chance Sea Ray builds one model or another that belongs on your shopping list. 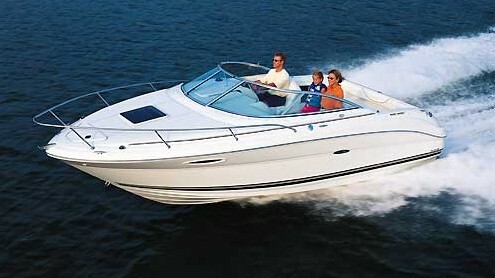 Other Choices: If you lean towards the express design, also check out the Cruisers Cantius 41 or the Tiara 39 Coupe. 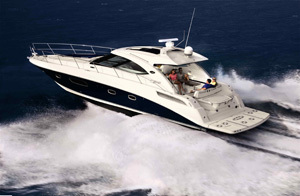 Those more interested in the flybridge version should consider the Carver C40, or the Bavaria Virtess 420 Flybridge. 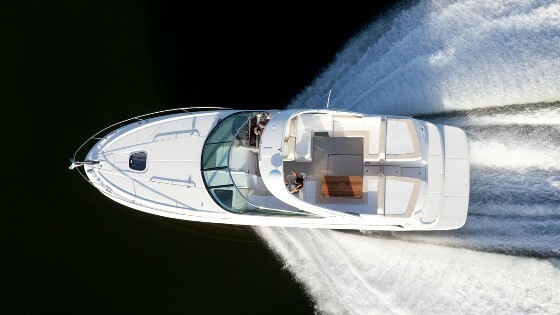 For more information visit Sea Ray, or see some Sea Ray 400 Sundancer or Sea Ray 400 Flybridge listings.